I took a trip down to Richmond to visit my high school friend Christine for her 25th birthday and a weekend of fun festivities. 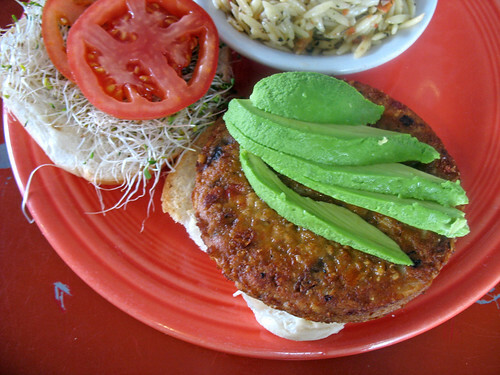 Of course, I knew I had to try a few veggie burgers while I was there. 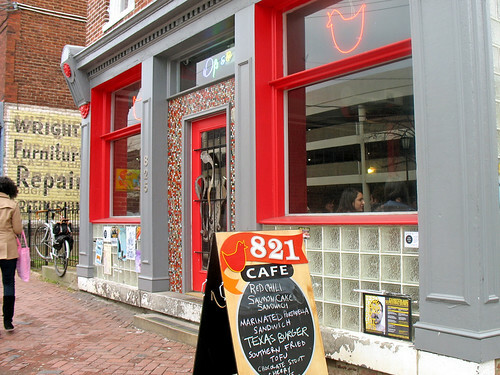 821 Café popped up in my research prior to the trip as the only restaurant that specifically advertised a vegan burger on their menu. So while Christine was at work one afternoon, I walked the mile and a half from her place to 821 Café on a quest for vegan burgers (I note the distance because, while I walk distances like that in New York all the time, it seemed nearly heroic in a city where everyone travels by car). Plus, their website describes the café as “hipster cool”, so I was curious to see what “hipster” means outside of New York City… (turns out, the definitions are pretty similar). It’s a cute, quirkly little place. Definitely trendy, but I can’t fault any restaurant for that when it means vegan options on the menu. When I sat down, the waitress announced that they were out of a couple things that day: “the catfish, and the vegan burger”. My heart sank. How could they be out of the exact thing I wanted to order? “We can serve the regular veggie burger with the vegan toppings if you want, but it has egg in it”. Since I’m not vegan myself, I decided that was a fair compromise, although I was disappointed to not be able to write a true review of the vegan burger (I’m still tagging this entry as vegan because hopefully vegans will have better luck than me, and visit the café on days when they are not out of stock). I suppose it’s a good sign that there is enough demand for the vegan burger though! 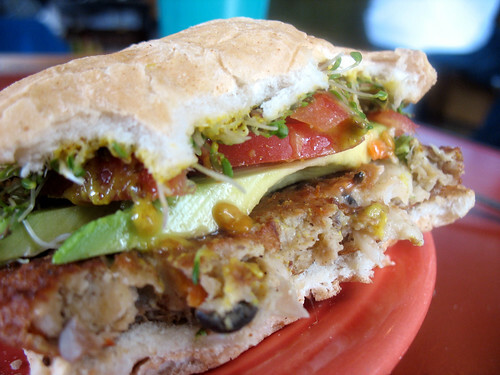 So my non-vegan burger arrived topped with sprouts, spicy mustard, avocado, and tomato. The kind waitress even double-checked to find out for me that the bun was vegan, too. Although the patty was a pre-made one, probably frozen (which explains how they could run out, if it’s something they purchase rather than making in the café) it was one of the better pre-made patties I have eaten. I tried to identify it’s ingredients: onions, peppers, beans, carrots, rice, and possibly mushrooms. It was crispy on the outside, and warm and textured on the inside. Not bad. Not as hearty as a homemade burger, but that’s to be expected. The toppings were what really elevated an otherwise-mundane patty. 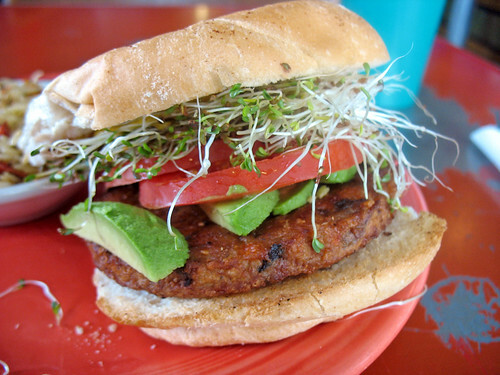 Avocado is one of my favorite burger toppings, and sprouts add a great, unique crunch. Athough I am normally not a fan of mustard, I actually really liked the spicy mustard on this burger. The bun was pretty good too, so overall I found it to be quite a satisfying lunch. The sides you can choose from (included in the cost of your burger) are numerous, but I ended up going with the herbed orzo – tasting strongly of rosemary, with bits of sundried tomatoes – which was delicious. The café was heavily populated with students from the VCU campus across the street, although I also saw an old man and a couple with a baby eating lunch on the other side of the room. Given the very reasonable prices and extensive menu, I cam imagine that if I lived in Richmond, I would probably end up eating here quite often. 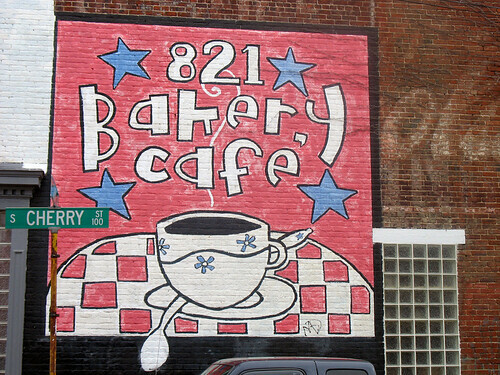 I've heard a lot of this about 821 cafe. We're planning to visit soon.